VB4 screenshot differences to past official blog post? 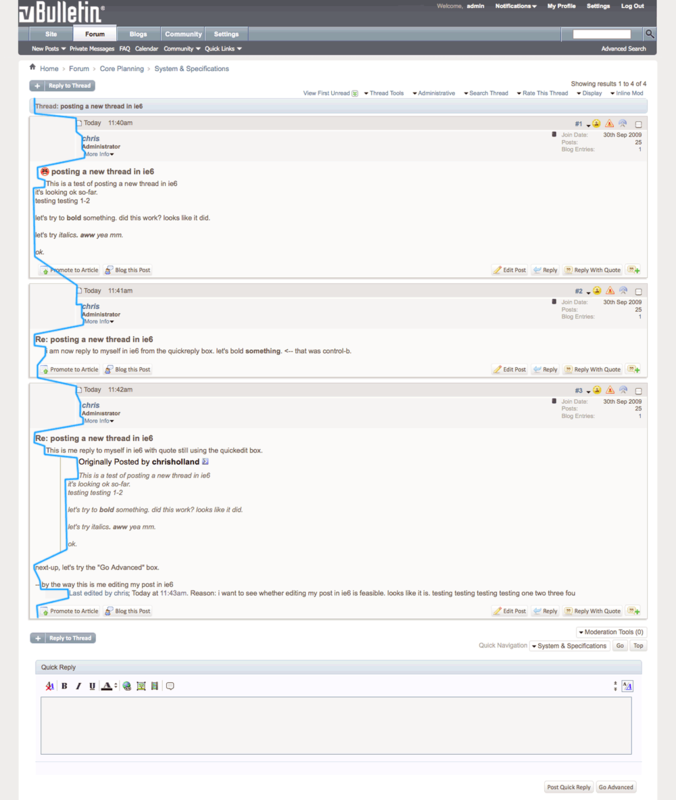 According to Kier, there were to be a few changes relating to the forumhome and showthread/postbits that he gave a screenshot of in his blog back in the spring. Have these been completely scrapped in favor of the way it looks now? SHOWTHREAD: Was stated would be the default again. I'm seeking clarity on this, thanks a lot! The samples shown by Kier were far more interesting in terms of look then then current sample screenshots. We need a good base template for the software out of the box atleast for a year b4 investing on a better template. Would appreciate some clarification too. Thanks for the link! I followed the link and I think the direction Kier was looking at is the right one. I hope they don't veer away from that look and stick to what is shown in Kier's blog. 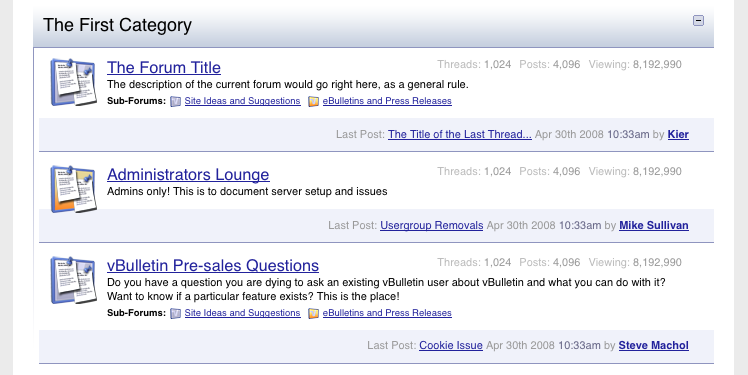 The underlying code in that old blog post is actually still in vBulletin 4.0. However during implementation, review and testing a number of issues were presented that required changing some fundamental aspects of the layout. Other things like colors, fonts, etc... are born by the desire to present a consistent and easy to use interface across all products without confusing non-technical users with too much change. 1: The quoted text doesn't look at all like a quoted text. It does not stand apart from the posting and makes the posting harder to read. 2: The 'edited by'-text has the same problem: it is part of the contents of the posting and makes the posting cluttered with information that should be devided from the posting. Just like vB3 does it. I am not happy with the way this looks by default. The screenshots by Kier looked very promising, but this doesn't. Hopefully more people see it this way and it can be improved for the final release. How much do you love XenForo? What kind of issues were presented? I feel like IB took Kier's ergonomic, evolutionary new layout and replaced it with something that a fourteen year old kid, with no experience in UI design, could have whipped up in a matter of minutes. As harsh as this sounds, I actually agree. They even hired an UI expert, but it doesn't show on the above screenshot, unfortunately. It's sad, really. I've seen other companies make poor design decisions like this because it's easier that way. Then someone else comes along and takes on the challenge and creates something truly innovative (is that going to be IB or someone else is the question?). I don't want the same look as all the other forums...I want something fresh like Kier was envisioning! Were there really issues that couldn't be overcome??? I sometimes wonder why a company can't see that some changes are good...even if it requires some extra effort to work past issues. A change in format would be better from what I'm currently seeing planned for VB4. Last edited by CyberSultan; Fri 16th Oct '09, 5:20pm. I rather like the version Kier presented aswell but don't mind the current screenshots either. I guess I will wait and see what customisations I can do with vB4. I have to agree too, Kier's clean to the point design is much better then what has been shown in the current design. The current design seems to be going backwards from Kier's design then improving. The style evolved based on the feedback and comments of the Alpha testers as well as very real usability issues. 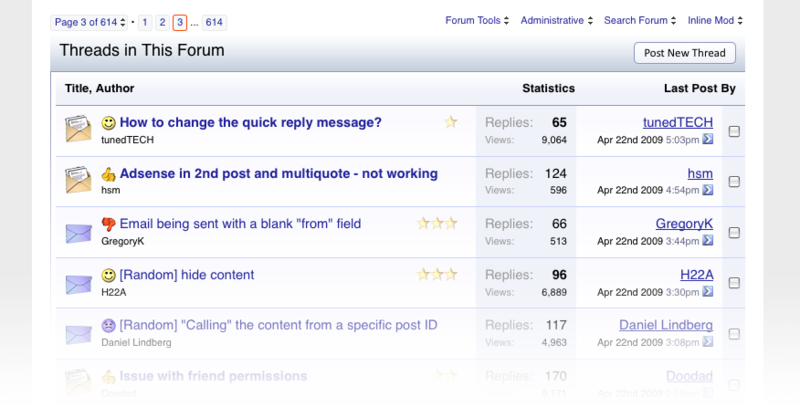 While the screen shots looked nice, the reality turned out to be much different on a live forum. alpha team is pool of <0.001% of vB users. i will have to use the beta and experience first hand. Challenges will be there, i faced it real-life in a s/w company. but for clients its the UI and u NEVER make compromise on that. Rightfully pointed out by Feldon overhere. I am not impressed at all by the postbit. Somehow it feels like a real step backwards instead of forwards. But, with IB 'running' this once respected company... the overall sheme of things is a BIG step backwards, this week has proven. I think there is something avatar which is missing. Unfortunately the style doesn't look like it evolved much. Are you sure the testers that provided the feedback just didn't want to loose something they were familiar with (at the expense of a much improved UI)? 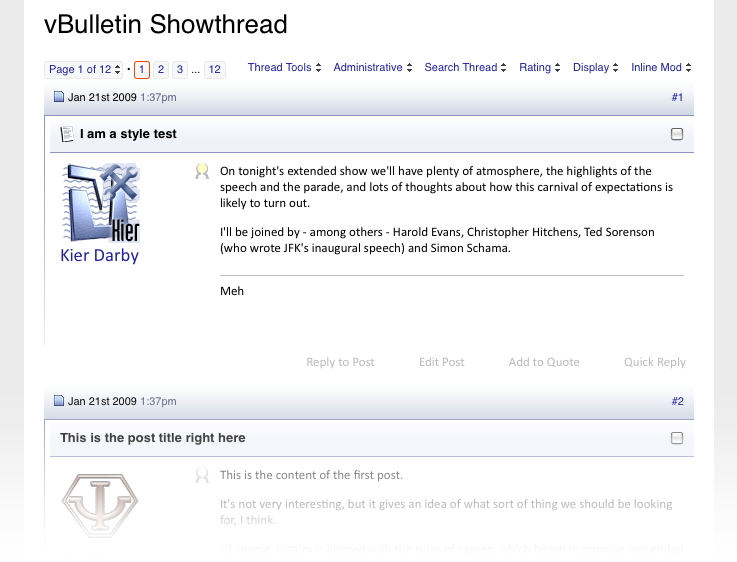 What you show now is the same basic column-layout for the forum home that exists today (which my free PHPBB3 uses). For a pay product, I would hope for a UI that blows away the others, which this UI falls short on and why I really like the layout Kier had came up with. The emphasis he placed on some elements while de-emphasizing others was spot-on too. You don't see that skimping on the UI is a bit short-sighted? What was so unusable about the style he proposed? 2. No pagination on the end of page.